Electric Underfloor Heating Cables offer an energy-efficient floor heating solution for new-build and renovation projects. What are Electric Underfloor Heating Cables? Heating Cables are electric floor heating wires that can be installed directly onto or into the subfloor, without the need for a mat backing. They offer great flexibility for layout design as they can be fitted around fixed objects and architectural features, making them the perfect floor heating solution for bathrooms and irregularly shaped rooms. The spacing of the cables can be altered depending on the required heat output (W/m2). Warmup’s range of Heating Cables include the Loose Wire System and the Inscreed Cable System. The DCM-PRO Heated Decoupling System features a Heating Cable with an accompanying anti-fracture membrane. Electric Underfloor Heating Cables offer an energy-efficient floor heating solution for new-build and renovation projects. The Loose Wire System is perfect for installing with a wide variety of floor finishes in your home renovation as the ultra-thin 1.8mm Heating Cable can sit within the layer of levelling compound or tile adhesive, thereby having almost no noticeable effect on floor build-up heights. The Inscreed Cable System is recommended for new-build projects as the cable is installed directly into a concrete screed, the depth of which can be taken into account during the specification stages of the project. The DCM-PRO System is ideal for both new-build and retrofitting applications and has been specifically designed for use with tiled floor finishes. The DCM-PRO Heated Decoupling System features a heating cable and an accompanying membrane which the cable is fitted in to. The membrane acts as a decoupling layer which can help prevent damage to the floor finish caused by subfloor movement. Loose Wire, also known as DWSWire, is a 1.8mm thin electric floor heating cable that is available as a kit featuring the cable, primer, tape and foam roller. It offers fast installation times for irregularly shaped rooms and can be used with almost all floor coverings. The Inscreed Cable is an electric underfloor heating cable that is ideal for installing within screeded subfloors in new build projects. It uses a slower heat-up and cool-down time than other systems, making it suitable for using in rooms which are in constant use. Which Cable is Best for me? No matter the floor finish, subfloor type or size of you project, there is an electric floor heating cable suitable for your requirements. The Loose Wire System is ideal for use with stone and ceramic tile flooring and can be installed onto Insulation Boards over concrete subfloors. If you are utilising a concrete floor screed as part of a construction project, the Inscreed Heating Cable has been specifically designed to be installed within this subfloor type and can be used with a wide range of floor finishes. The DCM-PRO System is the perfect heater to use with tiled floor finishes. It is a heated decoupling system that utilises an anti-fracture membrane in which to fit the heating cable. Heating Cables offer a low-profile floor heating solution that won’t substantially raise floor levels. The Loose Wire system is the thinnest heating cable on the market, at just 1.8mm, making it an ‘invisible’ heating system that can be installed within a layer of levelling compound or tile adhesive. The Inscreed Cable has a slightly thicker width of 6mm but is installed directly into a concrete subfloor so has no impact on floor build-up while the DCM-PRO features a system depth of 5.5mm. All heating cables should be installed alongside suitable insulation materials such as our Insulation Boards, which enhance the energy-efficiency of the system. Heating Cables are recommended for irregularly shaped rooms and rooms with multiple fixtures such as bathrooms. You can lay the cables down onto the subfloor in whatever layout is most suitable for your space, winding them around corners and fixed objects like baths and shower trays with ease. 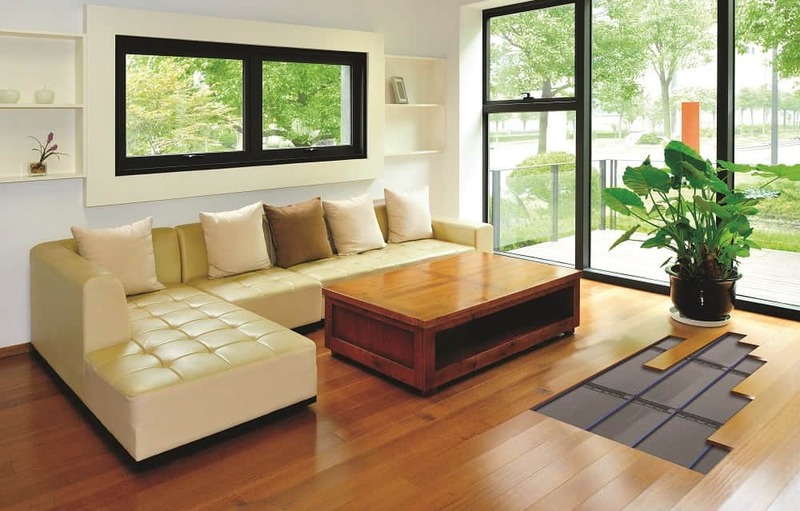 If you wish to install floor heating in a more regular-shaped room with open floor spaces, our electric floor Heating Mats may offer a better solution for your needs. Heating Cables facilitate quick installation times and can be installed with no need for specialist tools. The Inscreed Cable must be laid a minimum of 50mm deep within a screed floor construction. The cable must be secured to the subfloor using the accompanying metal fixing strips which hold the cable in place before a cementitious screed is poured over. To install the Loose Wire System simply prime the subfloor and mark out your cable layout before placing the cable where needed, taping down into position as you work. Always make sure to keep a minimum distance of 50mm between the cable runs. Loose Wire can be covered with a thin layer of levelling compound or tile adhesive before covering with your chosen floor finish. Due to its self-adhesive backing, the DCM-PRO’s decoupling membrane can be attached to the subfloor rapidly and easily. The membrane’s castellations act as a pathway for the DCM-PRO Heating Cable, simply push the cable into position with your hands, keeping a minimum distance of 60mm between cable runs. Once you are happy with the cable layout, simply cover with self-levelling compound or tile adhesive.